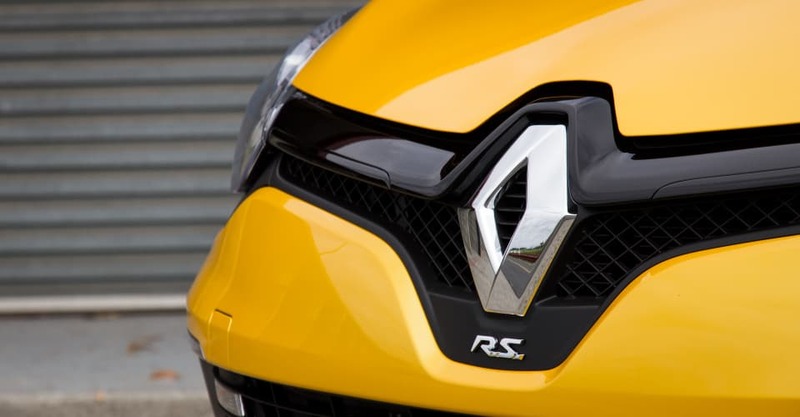 Renault likes to think of its RS road cars as having ‘DNA’ spawned from the racetrack. 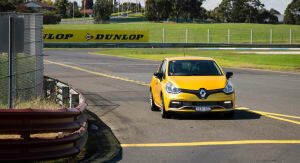 So what better way to test the theory than flip things back the other way and take its city-dwelling Clio RS to Sandown Raceway for another CarAdvice weekend warrior track test. 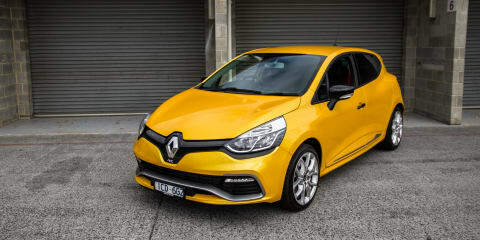 One of the latest additions to CarAdvice Melbourne’s long-term garage, this particular little fella is our Liquid Yellow Renault Clio RS200 Sport Premium. A top-spec version of the range’s entry-level model, the RS starts at $34,790 (before on-road costs). 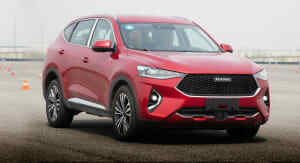 Under its stubby nose is a turbocharged 1.6-litre four-cylinder engine developing 147kW at 6000rpm and 240Nm at 1750rpm. 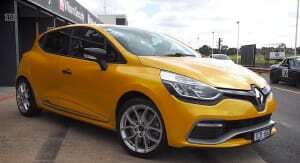 The old naturally aspirated Clio III’s three pedals and six-speed manual gearbox are gone, replaced by a new six-speed dual-clutch automatic transmission and two steering column-mounted shift paddles. Outside, things look suitably sporty. Up front, there’s a satin grey F1-style aero ‘blade’ and a matching rear diffuser out back. 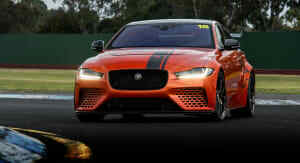 Gloss black door handles and wing mirrors are present and join a rear spoiler, chrome exhaust tips, and 17-inch alloy wheels running 205mm-wide, 45-profile Goodyear Eagle F1 tyres. 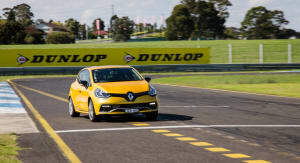 An electronic limited-slip front differential – intended to prevent one front wheel spinning faster than the other – is also standard, as is Renault’s ‘Sport’ chassis. Inside, drivers get to put their bums on heated leather sports seats, their feet on aluminium pedals, and their hand on a proper handbrake. 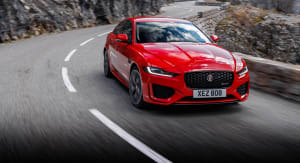 There are plenty of bright red highlights to impress the style conscious and a seven-inch touchscreen with satellite navigation to please the techies. Keeping the boy-racers (such as yours truly) happy, the in-dash screen is also home to the zippy Clio’s RS Monitor telemetry system. 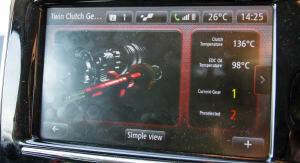 Able to display real-time vehicle information such throttle, braking, steering angle, power, torque, g-force and vital engine temperatures while on the fly, the system additionally supports data logging. 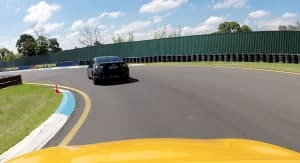 Very cool and a big plus for those serious about improving lap times. 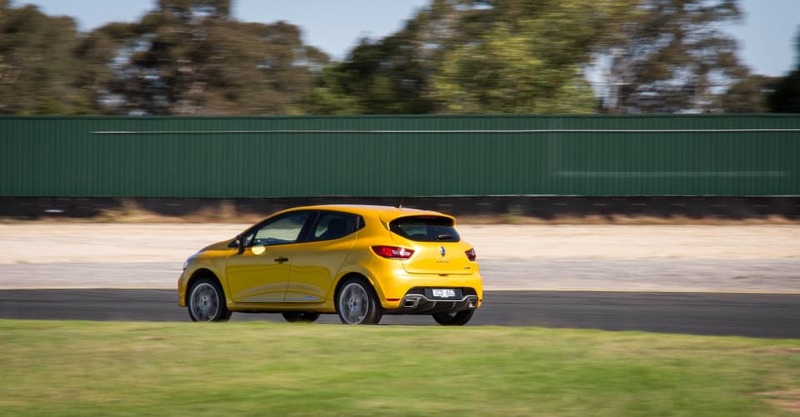 Sitting proudly below the gear lever – right next to the Renault’s supremely oddly placed cruise control switch – is the Clio’s ‘RS Drive’ button. Finished in silver, this little button allows drivers (or annoying passengers) to switch between three different driving modes: ‘Normal’, ‘RS Sport’, and ‘Race’. Another neat trick of the little Frenchy is its launch control function. 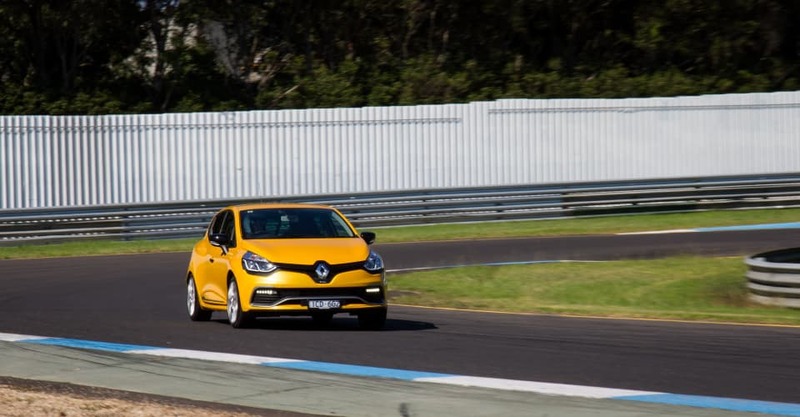 Easily activated by simply pulling both shift paddles simultaneously while keeping a foot on the brake, the feature helps the Clio RS claim 6.7 seconds 0-100km/h. 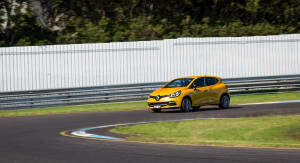 Oh yeah, it’s also got five doors, five seats and a 300-litre boot, but who cares about that when you’re at a racetrack. Track days are all about removing all loose items from the car, and giving it a pounding on the black stuff – and hopefully, not off it. It’s always exciting rolling down Sandown’s pit lane, past gathered cars and out onto the main circuit. You give it some hot sauce, grab a gear and realise that out here, you don’t have to worry about traffic (usually) or wildlife (also usually) or police. In fact, as strange as it may sound, track driving really is an excellent form of relaxation; even meditation. I’ll explain. Clearing the head is vital for both and when all you are concentrating on is putting the car in the right place at the right time with as much speed and as smoothly as possible, there isn’t a lot of room in your head for much else. 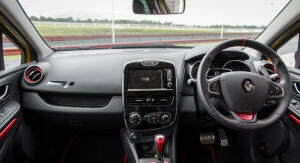 Nestled comfortably into the Clio’s heated leather seats, lateral movement is limited by some mild bucketing, and headroom, even with a lid on, is no issue – unlike in the previously track tested Kia Pro_cee’d GT. 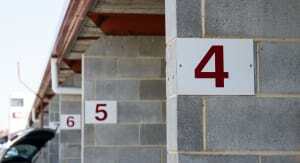 Vision out of the mirrors is also excellent, allowing fellow track-day participants to be easily spotted. 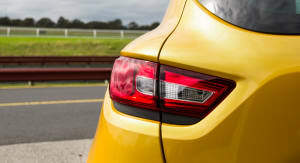 Amply punchy when navigating inner-city streets, the little turbo 1.6-litre is far from a stonking powerhouse out on track. Revving out to just shy of 6500rpm though, it’s plenty pokey and, while overtaking manoeuvres are best tackled with some time on your side, it provides enough hustle to help us reel in and pass a Mini Cooper, Toyota 86 and first-gen Porsche Boxster. Feeling quietly pleased with our 190km/h-odd top speed down Sandown’s 910m back straight, the sometimes cruel mistress of context rudely interjects as we get devoured at speed by a Nissan GT-R. Even with the gear lever shifted over to ‘manual mode’, you still have to decide just how keen you are and how hard you want to go. Leave things in ‘Sport’ and a buried right foot will eventually be greeted by an automatic up shift. 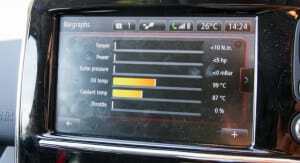 Push and hold the RS Drive button for a few seconds longer though, and you’ll engage ‘Race’ mode. Apart from backing stability and traction control right off, this setting also means all shifts, up and down, are entirely done on the driver’s terms. 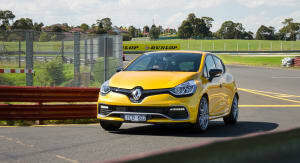 It’s worth noting too that the Clio RS’s clever little gearbox can be encouraged to drop down to its lowest possible gear for any given speed by pulling and holding the left paddle. 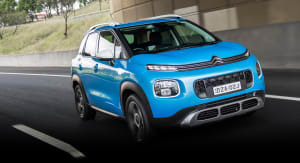 As smart as it is, it can’t quite give you the same engagement and driving experience as a ‘proper’ manual gearbox and somewhat requires drivers to tailor their driving and driving style to the transmission. 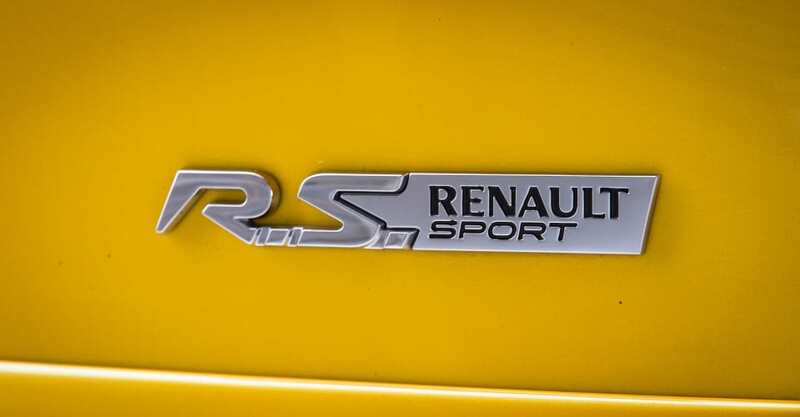 Impressing us throughout the day, the Renault’s Sport chassis delivers a sound balance of reasonable ride comfort with taut body control. 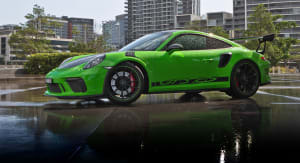 Not quite as edgy as the lower and stiffer Cup chassis, the Sport setup gives little away in terms of on-track performance while still making speed humps around town more than manageable. The 1218kg RS200 does move around a little under harder braking, but if you’re smooth and smart with it, it will remain well balanced and composed. 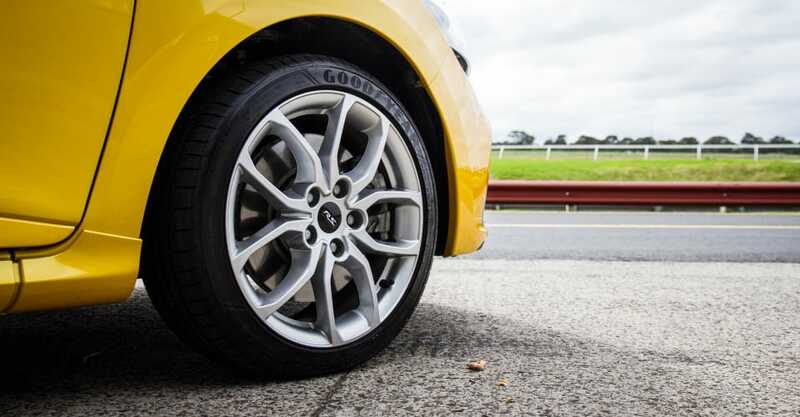 Helped by consistent and excellently weighted steering, which also provides good feedback, the Clio happily tips into corners and nimbly changes direction. Doing its bit here too is the solid grip awarded by the standard Eagle F1 tyres. Succumbing to some minor squealing later in the day, overall the Goodyear’s provide plenty of lateral purchase and turn-in response. Starting out well in the initial laps, as the laps go on, the brakes do demand deeper and deeper left-pedal applications, but they steadfastly soldier on, generally remaining bitey and tied to a firm pedal underfoot. A bit of fun on the street, the real-time RS Monitor telemetry system is a helpful and informative tool at the track, however, we experience intermittent freezing of the system and a complete lock-up at day’s end – surely something that would displease circuit-focused owners. 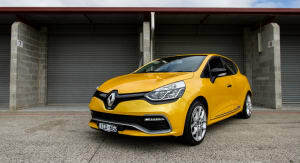 Click on the Photos tab for more 2015 Renault Clio RS200 images by Tom Fraser. Videography by Igor Solomon and Frank Yang.